This brief tutorial shows how to install BlueGriffon WYSIWYG editor on Ubuntu 13.04, 12.04, 12.10, Linux Mint using the GetDeb repository. The GetDeb repository contains the latest packages for Ubuntu 13.04 Raring, 12.04 Precise, and old versions for Ubuntu 12.10, 11.10, 11.04 and 10.04. 1.) Download the getdeb package and double-click to install. It adds the repository to your system. 2.) 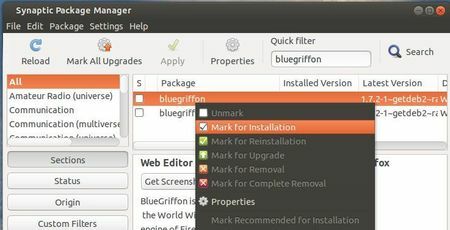 If you installed Synaptic Package Manager, open it, click Reload button and search for and install BlueGriffon package. Tanks for this tip. Bluegriffon is ok.
in the end I just downloaded BlueGriffon from their website, unpacked it and ran it direct from the folder. Not ideal but it works! Hi. I have one problem with this ppa, how I remove it? I want remove this ppa, of this package, but when i remove by .deb package i do not have sucess, how I do it? To remove the repository, open Software & Updates utility from Unity Dash. Under Other Software tab you’ll see a list of third-party repositories you added, un-tick the line that says “archive.getdeb.net …” will remove the PPA. Under Authentication tab you can remove the key file for GetDeb. Thank you Ji m; it also works fine on Ubuntu 14.04 – 64 bits. Tried this on 14.0 but synaptic package manager does not show bluegriffin. Any idea what I am doing wrong. I am new to Ubuntu. I can’t get it to completely run in Kubuntu 14.04, 64 bit. The program comes up, but it crashes as soon as I try to pull down a menu. Yes. it crashes under Kubuntu 14.04 as soon as I try to pull down a menu. But when I start it as root from a konsole (terminal) by typing : ./bluegriffon, it works normally. Why that? Any trouble with file-rights? Term method worked fine on Ubuntu 14.04 64, thanks!